Dozens of Iranian Sunni elites gathered in Tehran on Sunday 7th May, 2017 to discuss on the strategy of the Sunni community over the upcoming presidential election. 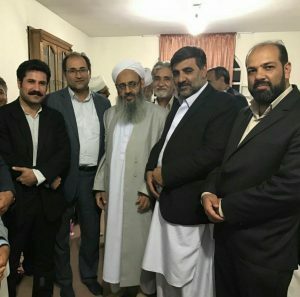 SunniOnline reported the Sunni scholars, Ulama, intellectuals and some current and previous Sunni members of the national assembly took part in a strategic meeting held by the call of Shaikh-ul-Islam Mawlana Abdol-Hamid, the most influential Iranian Sunni scholar and rector of Darululoom Zahedan. The participants shared their ideas on the election and anxieties of the Sunni masses in Iran. Most of the Sunni elites were from Tehran, Sistan-Baluchistan, Khorasan Jonoubi, Khorasan Razavi, Golestan, Kurdistan, Kermanshah, Gilan, Azerbaijan Gharbi and the rest of provinces. In all probability, they will have more meetings in oncoming days. The Sunni elites decided to form a “strategic council” for codifying the main demands and problems of the Sunni community. The council which includes Ulama, scholars and other social activists will meet the top candidates for presidency. The results of the meetings with the candidates will be shared with the community representatives. It is noteworthy the 12th presidential election in Iran will be on 19th May across the country. The Iranian Sunnis, with about 7 million votes, have not supported any particular candidate yet. In the last election, they voted for the current moderate president Hassan Rouhani.